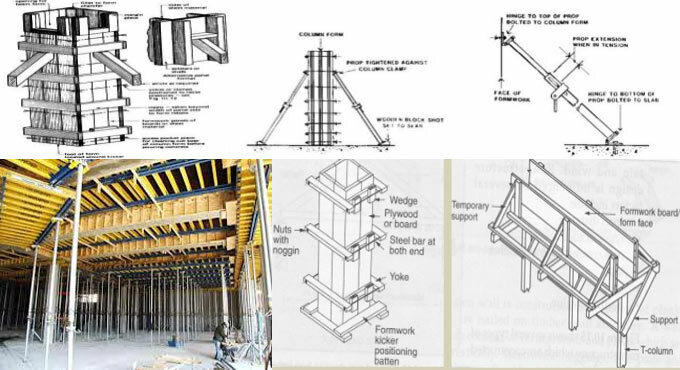 The objective of formwork (Shuttering) is to retain newly arranged freshly placed and compacted concrete unless it has achieved adequate strength for becoming self-supporting. It can also be used to form a concrete member of the desired shape, size and the finish. 1. The formwork should be adequately strong so that it can resist unnecessary deflection throughout the setting of the concrete. f. Horizontal pressure of the wet concrete against vertical formwork. 3. It should be arranged to perfect alignment and level inside the permissible tolerances and contain any camber necessary in the drawings. 4. Joints should be sufficiently stiff to stop loss of water or cement paste from the concrete. It should be examined perfectly since any leak can provide a significant effect on the appearance of the finished concrete surface and structural integrity. 5. The panels should be set in an efficient manner so that they are not ‘trapped’ throughout striking, and there should be provision to affect side forms from beams keeping the soffit shuttering unaffected. 6. The size of panels or units should be maintained in such manner that it can be securely managed at site with the existing equipment. The design should be followed by clean and easy method of erection and striking. Besides, form liners of rubber, thermoplastics or other sheet materials, as well as permeable liners, to create controlled permeability formwork systems may be used. Some liners can be reprocessed but others can only be utilized for one time.